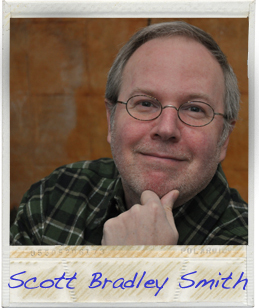 Scott Bradley Smith has been gainfully employed as a produce peddler, box boy, bus boy, bowling alley cleaner, electronics parts assembler, waiter, university instructor, legal document coder, public relations specialist, communications generalist and freelance writer. He left Tucson, Arizona in the early ‘90s to run a writers commune in Pittsburgh, which spawned a hefty body of work and at least one baby. He plays bass in an improvisational band that doesn’t yet have the nerve to play out. For more on Scott, visit www.scottbradleysmith.com. Read the first page of Scott’s story!